We see the return of another Aeroplan conversion bonus! Last seen this past summer, the hotel only transfer bonus is back but this time it's a flat 30% bonus miles instead of the flat 35% seen in the previous version. 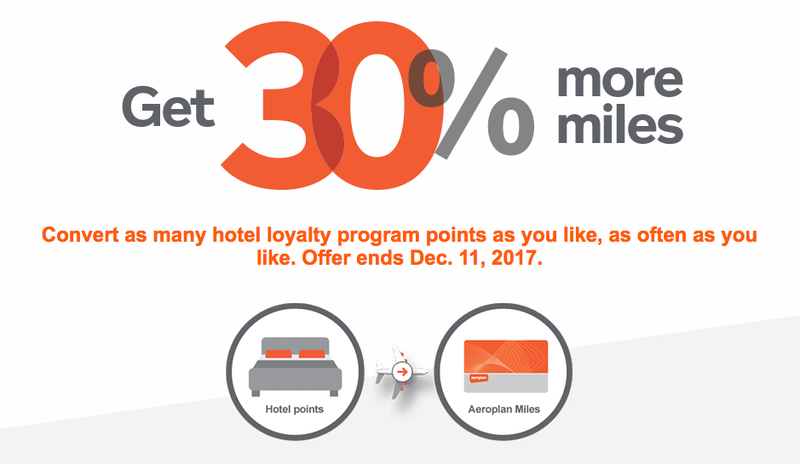 You have the make sure that you transfer enough hotel points to earn 5,000 Aeroplan Miles in your account by December 11 to get the 30% bonus which of course is lower than the summer promotion but what is good again is that the bonus is not tiered like we were used to prior to the summer and 30% is still a pretty good deal especially if you have you eyes on a flight reward in the next few months. Your best bet for transfers is Starwood Preferred Guest of course since they transfer 1 to 1 to Aeroplan and if you transfer 20,000 Starpoints at one time SPG will throw in an additional 5,000 miles for 25,000 Aeroplan miles. With the conversion bonus you are actually looking at getting 32,500 Aeroplan Miles for the 20,000 Starpoints. Those miles can get you two short haul tickets so you can see the potential value in transferring Starpoints to Aeroplan. Normally we would recommend getting the Starwood Preferred Guest Credit Card to be able to take advantage of this offer but seeing how there is only a one month window for it chances are getting that card and the points from would most likely happen after December 11th. You could look at getting the American Express Cobalt Card since it earns Membership Rewards points which you have access to immediately and start putting tons of spend on it in the 5x Food & Dining category and then convert whatever points you have to SPG shortly before December 11 and that will equate to 2.5 Starpoints per dollar spent.